‘What is love?’ some of you might ask now and then. 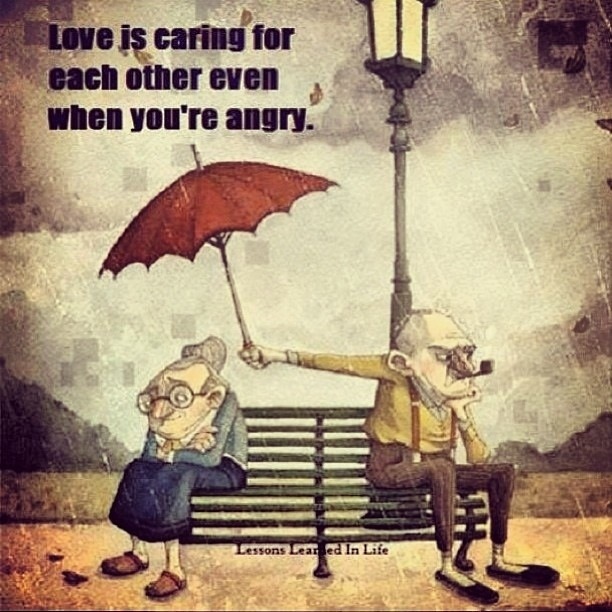 To me, love is caring for the person you love, even when you’re mad at them. And this pic sums it for me really. There was one day few months ago when we were supposed to meet really early in the morning for an all-day out-of-town excursion. But things screwed up and we got into a huge fight, when I should have let whatever issue go but was too furious to do so. I continued to bicker, insisting on things that really shouldn’t matter. Well, it doesn’t matter now, because I can’t even explain clearly what we were arguing about. It went on for ages and the conversation was going nowhere. I finally gave up and walked away to clear my head. Then I realised she was hungry and experiencing gastric pain, so I silently walked further away to look for food for her. She probably thought I was going to disappear. I crossed two streets before I finally found a stall selling hot snacks and water. When I headed back, she was walking towards my direction. Maybe she was looking for me? So I walked up to her and somehow she was sitting at the bus-stop looking tired, sleepy and lost. Me? I probably looked grouchy and up for another argument. When I passed her the food and water, she gazed at me with a puzzled expression. Thankfully, she started eating. At that moment when I looked at her silently chewing her food, I realised I have a weird way of showing someone how much I love and care for them. Getting into fights and not wanting to let the anger go is not the cleverest thing to do if I really value someone. I should enjoy each moment we have and fill our time together with happiness, not regret. This has been a painful lesson learnt.